In 2018, the transshipment of containers at the Baku International Sea Trade Port amounted to 20,564 TEU (twenty-foot equivalent unit), which is 45.3 percent more compared to the previous year, Vefa Safarli-Abdullazade, the spokeswoman for the port, said, AzVision.az reports. She noted that the freight traffic has increased. So, during the reported period, the figures reached 3.9 million tons. Safarli-Abdullazade said that most of the freight (52 percent) accounted to the cargo turnover with Turkmenistan. The construction of the new Baku International Sea Trade Port complex started in 2010. 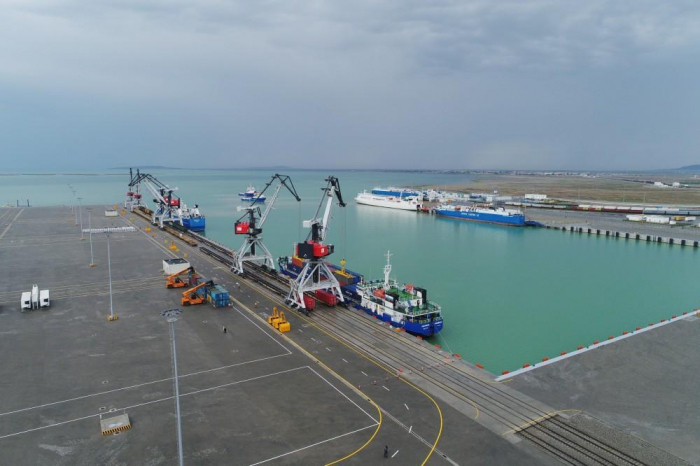 In September 2014, the ferry terminal was commissioned, and in January 2018 - the Ro-Ro terminal. The port covers a territory of 117 hectares and has 12 berths. The total length of berths is approximately 2,100 meters. The cargo transshipment potential of the Baku port within the first phase is 15 million tons, including 100,000 containers per year. Seven berths out of 12 existing ones serve dry-cargo ships, two berths serve ferries, and another two berths serve the Ro-Ro and Ro-Pax vessels. Another berth is used to service the flotilla of the port. A passenger terminal is also envisaged to be constructed at the port and after its launch, the port will be able to serve 150,000 passengers.